[Monmouth Park] also posted an all-sources handle of $20 million, which is a non-Breeders’ Cup record. 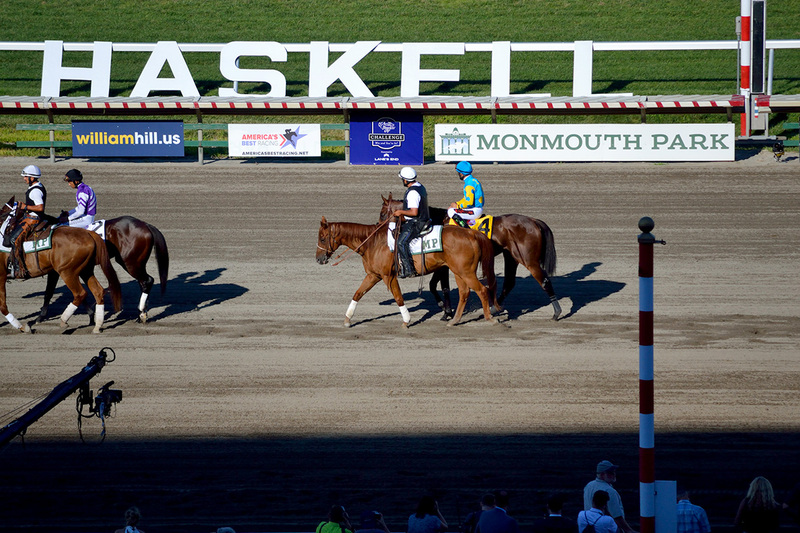 The Haskell alone brought in a record $6.54 million, shattering the mark of $4.4 million bet on the 2010 edition. To anyone who questioned why the track bumped the purse of the race from $1 million to $1.75 million, that is your answer. American Pharoah brings in people, betting dollars and a great deal of mainstream exposure. That’s a pretty great trifecta for the sport. NYRA wants to see that kind of action on the Travers Stakes, and is trying to lure the colt’s connections with a promise to raise the Travers purse to $1.6 million, up from $1.25 million, if American Pharoah follows his Haskell win with a Saratoga appearance. Owner Ahmed Zayat wants to go. “My preference would be to run [next] at Saratoga,” Zayat told Bob Ehalt. “If it’s up to me, it would be the Travers,” he said to Ron Mitchell. “I have made my desires known to my trainer. He knows what I want.” Trainer Bob Baffert says that’s the case, and that Zayat is deferring a decision on the Triple Crown winner’s next race to him. “[T]his is true and accurate statement,” Zayat confirmed with a tweet. This is an interesting little dilemma for owner, trainer, and Coolmore, who will stand the big horse at stud. Sid Fernando’s been dissecting the conflict and incentives via his Twitter stream, discussing the almost-certain “kicker” for winning the Travers (essentially a performance bonus), built into the breeding rights deal Zayat and Coolmore negotiated. In the scramble for American Pharoah’s next start, the Travers seems to have moved ahead of the Pennsylvania Derby, which is the race I thought he’d point to next, given the likely purse boost, appearance fees for owner and trainer, and Baffert’s lack of interest in running the colt against older horses before the Breeders’ Cup Classic. Parx racing director Sam Elliott has been working hard to sell his race, traveling to Churchill Downs, Santa Anita, and Monmouth Park in pursuit, but Zayat has said “No Penn Derby” and ruled out the Pacific Classic as well — “zero shot!! Timing doesn’t work.” Elliott was at the Haskell on Sunday — I hope he didn’t get the Pennsylvania Derby news on Twitter too. Mike Pegram, a long-time owner with Baffert, was blunt about the where-next question. “They’ll go where the money is,” he told Ed Zieralski. The Travers’ historic significance plus the added money makes a sweet exacta. Odds and ends: American Pharoah was given a Beyer speed figure of 109 for the Haskell … Upstart will point to the Travers after running third to the Triple Crown winner on Sunday in his first start since finishing last in the Kentucky Derby. “I was miserably impressed,” trainer Rick Violette said of the Haskell winner … Monmouth reported attendance of 60,983 for Sunday’s race, a figure Chris Rossi calls into question by comparing per-attendee handle for the Haskell since 2000 (chart here, if you follow him on Twitter). This year’s $48.58 is the lowest average in that period, beating the previous low of $65.35 set in 2009. In 2014, the average was $70.29 … you can definitely rule out a possibility that probably hadn’t even occurred to you: The Eclipse Stakes winner Golden Horn will not meet American Pharoah in the Breeders’ Cup. “It’s a complete no-no, on dirt certainly,” said owner Anthony Oppenheimer. Saratoga babies: The spreadsheet of 2015 juvenile race starters and winners has been updated through second week results (XLS). If the Haskell Invitational, Pennsylvania Derby, and Breeders’ Cup Classic is the Triple Crown winner’s path for the rest of 2015, I’m going to say, called it. from a scheduling standpoint, considering the value of winning the Breeders’ Cup for the horse, is what they’re considering. I’m not sure how much the financial part comes into play, but money is money and everyone likes it. I’m sure they’re going to sit down and do what’s best for the ultimate goal of the horse. Hopefully he runs at Monmouth and then in our race. Sorry to repeat myself, but Baffert has had lousy history at the Travers since Point Given won it in 2001, and he’s been spectacular in the Haskell, winning it a record seven times. Bayern won it last year and followed up with a win in the BC Classic. Enough about 3-year-old restricted races — why not try him in the Whitney?